This was one of the items that came in my student package when I took the Fashion Makeup course at Make Up For Ever Academy Singapore last year. I’ve never used the palette on myself because I’m not really a concealor kind of girl; I don’t really like layering on too much makeup on my skin. I have, however, used this palette on my models for classes and here is my tiny review based on what I know. The palette contains 5 different kinds of cream concealors, each in a different shade for different purposes. The shades from left to right are 13 (light beige), 16 (brown), 17 (green), 18 (purple) and 20 (reddish brown). 1) The concealors in this palette are very, very highly pigmented so only a very tiny amount is required each time. What you see is what you get. 2) The concealors are easily blended. 3) To have 5 different kinds of concealors all in one place is awesome. In my opinion, this is the best selling factor of this palette. 1) Compound base. The concealors are of a creamy texture. Some people prefer liquids over cream but to me they aren’t much of a difference, since I don’t really use concealors. 1) The price. I can’t remember how much it cost me exactly as I’ve lost the receipt, but I know that it’s pretty expensive! This is one palette that makeup artists could have if they don’t already have one. 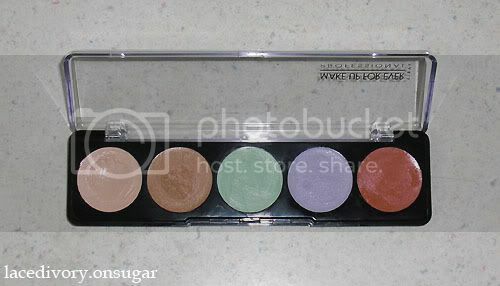 Review: Make Up For Ever’s 5 Camouflage Cream Palette in Shade 05 was last modified: August 19th, 2010 by Roxanne C.